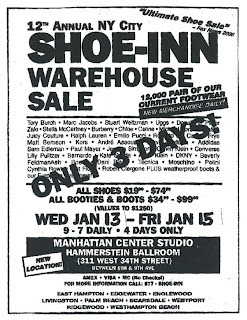 If you missed the Shoe-Inn sale this week at Gotham Hall, be sure to check out the continuation of the warehouse sale in the Manhattan Center Studio at Hammerstein Ballroom - 311 West 34th Street, between 8th and 9th Avenue on January 13th - 15th. I was hoping for deeper discounts on the last day at Gotham Hall but there was only an additional 10% off. The sale at Hammerstein starts at lower price points, so I am glad I resisted the urge to splurge! All Shoes are $19.99 - $74.99 and all booties and boots are $34.99 - $99.99. New merchandise daily. 3 days only.